Yesterday I went to Dublin’s for lunch. I ordered an O’so Night Train Porter to go with my meal. It was the first time since April that I’d had a Night Train and when I took that initial draw it was like meeting up with an old friend. I drank a lot of this last winter, but I’d forgotten what a fine beer it is. It’s full and creamy with a pleasant roastiness that stops just short of being sharp. It’s a beer that’s great for keeping around the house and dipping into every day. It has more than enough flavor complexity to keep you interested, but it’s not so loud that it wears on you. Over the past week I’ve had a number of excellent beers in Oshkosh that were all in this same vein. There was the Chief Black Hawk Porter from Tyranena that Becket’s has going, Potosi’s Gandy Dancer Porter at Oblio’s, Central Waters’ Oktoberfest, the Dark Lager at Fratellos and now I see that O’Marro’s has O’so’s Rusty Red on tap. These are beers that aren’t extreme or flashy enough to generate the sort of hype that gets everyone cackling, but they’re each so good in their own way that to take any of them for granted would be a mistake. And they’re all from Wisconsin. There’s a lot of great beer being made in Wisconsin right now and because it’s so easy for us to get it’s also easy to forget how lucky we are to have it. I was thinking about this a couple weeks ago when I heard stories from the Great American Beer Festival about how the lines in front of the New Glarus booth were 100 people deep before they even began pouring. It’s hard to imagine waiting in a line like that to get a small sample of a beer that we can buy at most any grocery store or gas station in Oshkosh whenever the urge strikes us. And when I was in Asheville, NC last month and told people I was from Wisconsin, all they wanted to talk about was the beer we have here. One guy, who was working at what is probably the best beer store I’ve ever been in, actually made me promise him that if I ever visited again, I’d bring him beer from Wisconsin. Asheville, by the way, was again named the top beer city in America this year. These aren’t people who are deprived of good beer. The point I’m trying to make is that we ought to take the time to appreciate what’s going on around here. You and I are living in one of the best places in the world to drink beer. Without a doubt, this is a golden age. And if there’s one thing history makes clear, it’s that golden ages do not last. We're fortunate. Let's enjoy this while we can. If you live in or around Oshkosh, you already know that we’ll be having our first Oktoberfest celebration this weekend at the Leach Amphitheater. What you may not have heard is that unlike the “Octoberfest” that was held last weekend just a few clicks up the road, the Oktoberfest in Oshkosh will offer authentic German beer. Here, at least, it’s going to be done right. Like the Munich festival, the action at the Oshkosh celebration will be based around beer tents named for the beer they’ll be pouring. The two large tents at the Oshkosh Oktoberfest will be the Paulaner Tent and the Hacker-Pschorr Tent and it looks like they’ll live up to the reputation of their namesakes. At the Paulaner Tent they’ll be pouring Paulaner’s wonderful Oktoberfest, the inaugural Oshkosh Oktoberfest (brewed by Point Brewery) and, for the less robust, Coors light. At the Hacker-Pschorr Tent, you’ll be treated to the incredible Hacker-Pschorr Oktoberfest, HP's Munich Gold (a near perfect Helles-style lager), and their very tasty Hefe-Weisse. If you’re so disposed, the always cold Coors Light will be there, as well. It won’t be just beer, of course. There will be authentic German food, music and a lot more that you can find out all about by going here. The approach their taking in making this an authentic Oktoberfest celebration is certainly welcome and, to me, much more inviting than the typical beer-party-in-the-street sort of thing. One final note: On Saturday morning, as part of the event, they’ll be staging an Oktoberfest 2K Bier Run (1.25 miles) in and around the Leach grounds. Best of all, the run will include four beer stops. As a seasoned beer runner, I can’t recommend this sort of thing enough. Beer and running are a natural combination and if you haven’t paired the two before, now is your chance. I can’t wait to lace ‘em up and lap it up. I’m a labelholic. I love examing the beer cans and bottle labels of bygone breweries and trying to tease out the information embedded in their imagery. Today I’d like to give you a taste of the stuff that fuels my addiction. 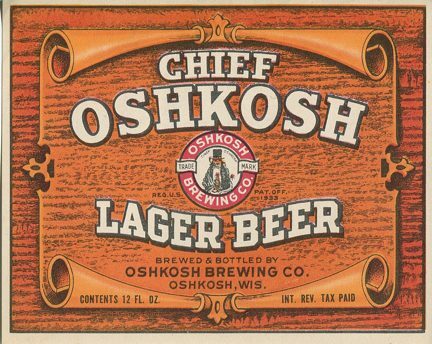 Here are six scans of bottle labels produced by Oshkosh's big three: Rahr, Peoples and Oshkosh Brewing. This beautiful set belongs to John Marx, a former Oshkosh resident now living in Madison who had the labels scanned so he could share them with us. Thanks, John! 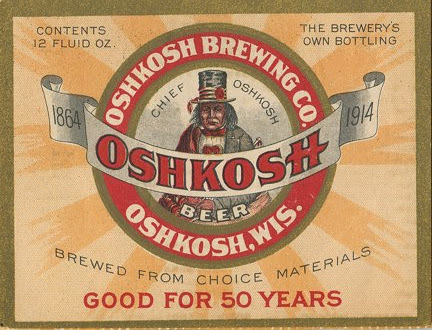 The first label, from the Oshkosh Brewing Company, is a pre-prohibition label from 1914. It marks the company’s fiftieth anniversary and it’s the oldest of the bunch. This Chief Oshkosh label is from the 1940s. 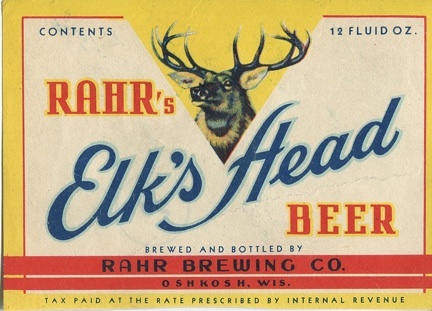 Here’s the label for Rahr's Elk’s Head beer as it looked prior to the 1950s. Notice that all of these labels have the “Internal Revenue Tax Paid” statement upon them. The requirement that brewers include this information on their labels was dropped in March of 1950. Here are a couple of interesting labels from Peoples Brewing. 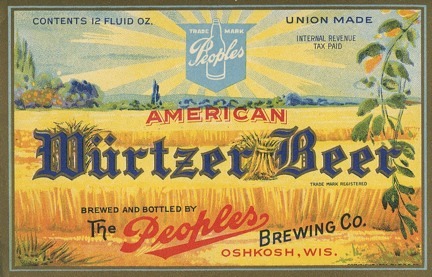 The original incarnation of these labels made no mention of “American” Wurtzer beer. 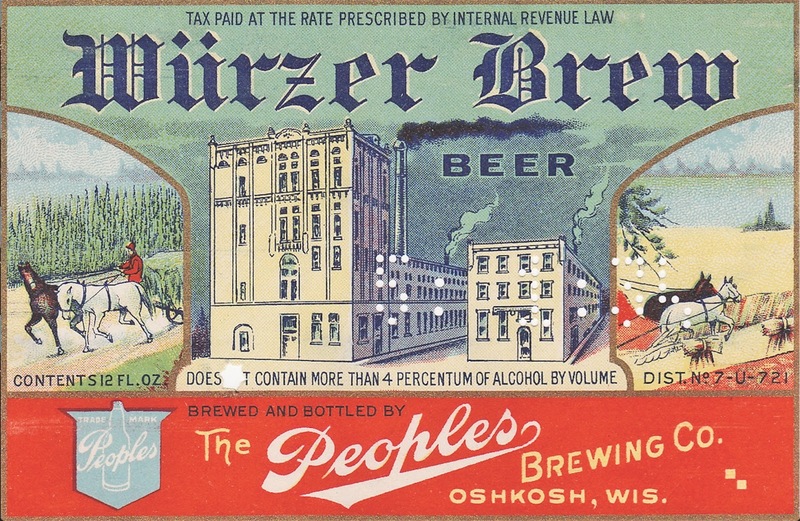 But with the onset of World War II, Peoples changed their label from “Old Time Wurtzer” to “American Wurtzer” in an attempt to downplay the Germanic origins of their brew. 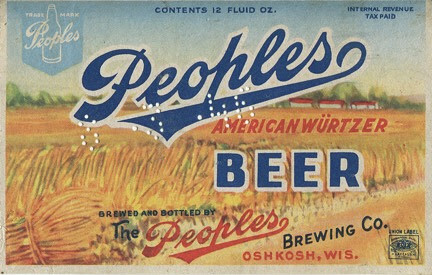 Finally, here’s a rare label for the only Ale brewed by a commercial brewery in Oshkosh during the post-prohibition era. 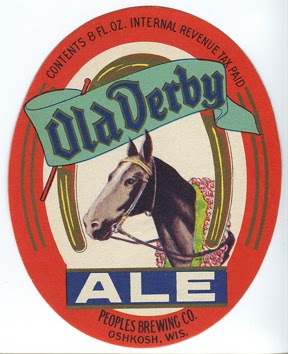 Production of Old Derby Ale was halted in the early 1950s. There wouldn’t be another commercial Ale brewed in Oshkosh until Fox River Brewing arrived more than 40 years later. I wish I knew more about these labels. Were they designed by local artists? Were they printed here in Oshkosh? If you have any information to share about these, please get in touch or leave a comment. And if you’d like a full-sized (suitable for framing) digital copy of any of these label scans, just send me an email. I’d be happy to pass them along, courtesy of John Marx. When I first noticed there was a beer out there named Monty Python's Holy Grail Ale I immediately dismissed it as some kind of gimmick beer. Then a few months later I learned it was brewed by the Black Sheep Brewery, an exceptional English ale brewery responsible for Riggwelter, one of my favorite beers. So when I heard from Nate at Barley & Hops that he was bringing the Holy Grail to Oshkosh I was primed for finally getting a taste of this brew on draught. And it did not disappoint. I love traditional English ales and this is an excellent example of what the best of them are all about. The beer pours to a bight copper and offers up a light scent of floral hops over bready, pale malt. It’s a subtle and delicious aroma that made me thankful there wasn’t a cloud of cigarette smoke floating in the bar. The mouth feel of this beer is fantastic. Smooth and creamy at the start and then developing a slight graininess towards the end. Nothing about the beer is out-sized, instead there’s a wonderful range of flavors here that all work in concert. The hop flavor has a ripe, earthy fruit aspect and it melds perfectly with the crystal malt sweetness that forms the foundation of the beer. This is an exceptionally balanced ale that remains continually interesting and complex from one pint to the next. And it’s a perfect session beer. At just under 5% you can easily work your way through a number of these without falling off your stool. Although you may find yourself spontaneously chirping NI! There was a time in Oshkosh when you could wander into most any tavern around noon and find a lunch counter loaded-up with everything from roast pig to oysters. Lunch buffets were commonplace in Oshkosh saloons in the late 1800s and early 1900s, but with the arrival of Prohibition the sample-room lunch spread became a thing of the past. Now, almost 100 years later, Shawn O’Marro is trying to revive the tradition. A couple weeks ago O’Marro’s Pub introduced their delicately named Gut Busters Buffet and it’s everything a saloon lunch should be. Each weekday, starting at 11 am and going until 2 pm, they put out a great spread of homemade food that’s a dead-ringer for the traditional sample-room buffets that were once served in Oshkosh. When I was there last Wednesday they had fried chicken, pork roast, baked beans, stuffing, mashed potatoes, roasted chicken, chili, salads and absolutely the best meatloaf I’ve ever tasted. It’s all down-home fare and Shawn O’Marro says “Everything is made from scratch. Brandy and Nate are put together the recipes and they’re going to continue to develop them based on the feedback we get.” If you’re up for a hearty lunch, this one will certainly hit the spot. There’s just one problem with all of this. The day I was there, there was a good-sized crowd and I happened to notice that my lunch partner and I were the only people in the place enjoying a beer with our meal. Has it come to this? Have the good people of our fine city grown so timid and tight that they can no longer enjoy a simple beer with their mid-day meal? I hope not. I felt bad for all those people eating that fine chow and chasing it with the spiritless chemistry in their soda cups. I think we can all do better than that. If you get to O’Marro’s anytime soon for lunch try the meatloaf and pair it with the excellent Bell’s Amber Ale they have on tap. You’ll leave with that satisfied glow our forefathers took for granted. Since this post first appeared there has been a significant number of additions to the Schussler story. Here is the full and complete version. On September 21, 1849 the Oshkosh True Democrat published an overview of Oshkosh that included the news that our town now had its own brewery. Unfortunately, the paper neglected to mention either the name or location of the new brewery. It’s likely the editors assumed they needn’t bother with such fussy details. The 1,032 residents of Oshkosh probably already knew all about it. There is no conclusive proof as to who was the first commercial brewer in Oshkosh, but there are a few shreds of information floating about that give us a glimpse into the very earliest days of brewing here. If it’s true that the first brewery opened in 1849, then there’s a good possibility that the brewer was a man named Joseph Schuessler. In the census of 1850 Schuessler is the only person living in the area whose occupation is listed as Brewer. We know that Schuessler was 30 years old in 1850 and had emigrated from Baden, Germany, but where he lived and brewed in Oshkosh at that time remains unknown. Here’s what we do know: In June of 1850 advertisements for beer brewed in Oshkosh begin to appear in the Oshkosh True Democrat when Johnson’s Ice Cream Saloon places a series of notices announcing their opening on the east side of Ferry Street (now Main Street). Among the products John Johnson lists for sale are Detroit Ale and Oshkosh Beer. 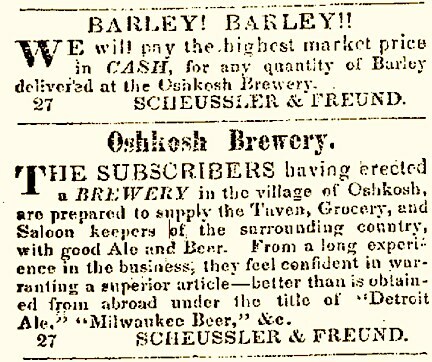 Then in September of 1850 Schuessler and his business partner John Freund begin buying space in the paper to say that they have erected a brewery in Oshkosh aptly named the Oshkosh Brewery, but like those before them they neglect to mention where the brewery is located. The first of these advertisements appears on September 6, 1850 and state that Schuessler and Freund “are prepared to supply the Tavern, Grocery, and Saloon keepers of the surrounding country with good Ale and Beer” and promise “a superior article — better than is obtained from abroad under the title of "Detroit Ale" or "Milwaukee Beer." The beer brewing business in Oshkosh was up and running. It seems the brewery faltered early on, though. By the end of 1850 John Freund was having financial trouble and his partnership with Schuessler was dissolved on January 1, 1851. Schuessler then took on a new partner, Francis Tillmans, but the business didn’t recover, it either petered out or was sold off. Hopefully, there will be more to come on that. In any case, it appears that by 1857 Schuessler was no longer making his living brewing beer. The Oshkosh City Directory for that year lists his occupation as cooper (barrel maker) and has him living on Wisconsin Street near Warren Road and the Fox River. As a cooper, Schuessler would have remained tied to the growing Oshkosh brewing scene, though, and perhaps he dabbled in beer making even after his brewery was no more. In the 1860 census his occupation is again listed as Brewer, but shortly after that his trail grows cold. 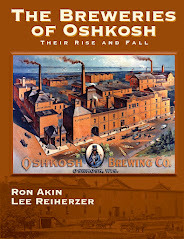 By 1864, the man who was perhaps the first professional brewer in Oshkosh, had left town. 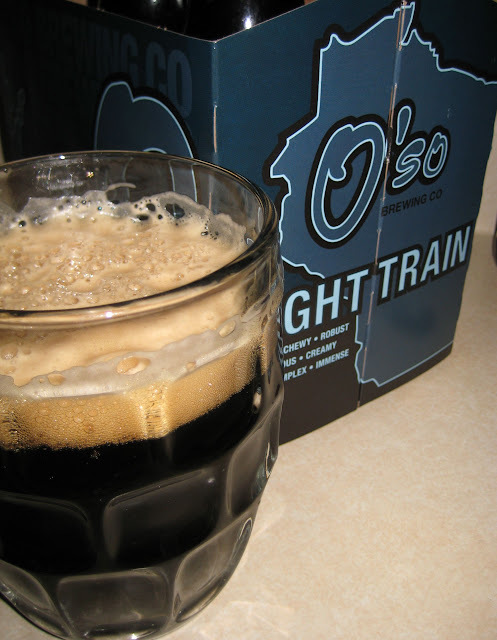 There’s no shortage of choice beer flowing in Oshkosh this week, but there’s a beer on tap at Oblio’s right now that fits the season better than any other brew you’ll find. Oblio’s has been pouring Hacker-Pschorr’s Oktoberfest for a couple weeks now and there’s something about sitting down behind a pint of it at that worn bar during the chill of mid-sepetmber that seems so right it makes all those boisterous, American craft beers seem a little too brassy. It’s time to pull those gardens down and celebrate with a rich mug of amber brew. The Hacker-Pschorr Oktoberfest has a shimmering copper hue with an aroma that’s part caramel and part biscuit underscored with a dash of noble hops. The beer has a medium palate with a slight and smooth caramel sweetness making it a hearty, satisfying brew that’s still very easy to drink. The beer closes with a wisp of hop bitterness and a malty, bittersweet finish ideally suited for a fall session of lager drinking. Todd at Oblio’s says they’re going to keep this beer on for the next couple months, so if you’re looking for a new “buddy beer”, this might be a good choice. I’ve been by Oblio’s for a few of these already and it seems to get better each time I order it. Bonus Beer: Another beer you might want to check out this fall is the Foxtoberfest that recently went on at Fratellos. This is Fox River Brewing’s take on the Oktoberfest style and it has turned into something of a local tradition. The beer was introduced in 2002 and it’s been coming back each fall ever since. Brewmaster Kevin Bowen has been kind enough to give us his notes on the beer and you can check those out here. Some folks look to the first robin of Spring as a reassuring sign that another harsh winter is nearing its end. And then there are those of us who possess a less sunny disposition. We’re the people who thrive in the dark and cold. We prowl liquor stores in anticipation of seeing that first six-pack of Oktoberfest hit the shelves. This is our liquid symbol encouraging us to hang in there, that the miserably hot and too bright days of late summer will soon be over. I saw my first Oktoberfest on August 12th and when I did I issued a groan of relief. The guy stocking the shelves scowled at me as if I were a creep. Anyway, Capital Brewery takes the ribbon this year for placing the first batch of Oktoberfest in Oshkosh. It arrived during the second week of August and since then the rich, amber fluid of fall’s beer has been flowing into town unabated. 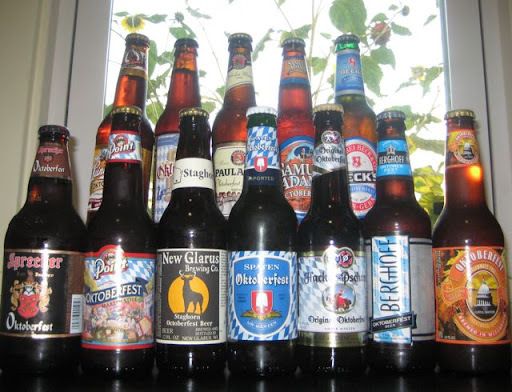 At the moment, you’ll find no less than 12 different Oktoberfest beers on sale in Oshkosh stores. Some of them are good, some of them are not so good. A few of them are great. 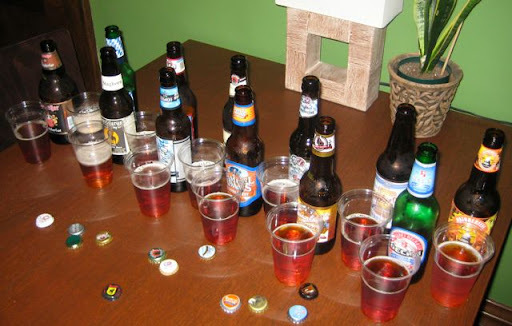 To help the Oshkosh beer buyer find their way through this maze of seasonal beer, we convened a panel of tasters to determine the best Oktoberfest of 2010 available for purchase in Oshkosh. Just a couple of notes before we get to the list. First, this list only includes bottled beer. There are a number of taverns in Oshkosh with Oktoberfest on tap, but for the sake of continuity none of those were included in these tastings. Second, where our tasters could not come to agreement on rankings we used composite scores from Beer Advocate and Rate Beer to resolve disputes. So without further ado, here are the top Oktoberfests of Oshkosh ranked in order from best to... not so best. Sprecher's Oktoberfest was the runaway favorite of the bunch. Malt-rich and creamy, this is a beer lover's beer. There's nothing "extreme" about it, this is simply a delicious and incredibly balanced traditional brew. If you drink one Oktoberfest this season, it ought to be this one. Beers two through four wound up in a virtual dead heat with Hacker-Pschorr getting the slight edge, but each of them was so good that at any given tasting the rankings could be quite different. Actually, there wasn't a bad beer in the top 10. We were surprised just how consistent they turned out to be. Each of the top 10 beers were quite drinkable and in-line with what they should be style-wise. Finally, if you'd like to stage your own Oktoberfest tasting check out the BJCP Style Guidelines for Oktoberfest before you begin. Understanding what these beers are all about will deepen your appreciation of them and enhance your drinking pleasure. Prosit! If you were a beer enthusiast living in Oshkosh in 1965 you were in a tough spot. It’s impossible to overstate just how uniform and banal the beer in Oshkosh was at that time. There were no pale ales, no IPAs, no wheats, no stouts, no porters. There was nothing amber, brown or black. Unless you possessed an unquenchable thirst for adjunct-laden, pale, American lager, you were you out of luck. That’s a far cry from the state of things today and it begs the question, when did the beer in Oshkosh begin to change for the better? The harbinger of what would be a long, slow evolution occurred in August of 1966 with the opening of the Old Town Pub and Restaurant. 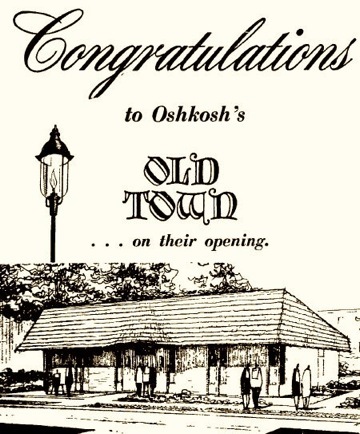 The Old Town, at 1013 North Main Street, was the first establishment in Oshkosh that tried appealing to people who craved something more substantial than fizzy, light lager. The pub featured 16 different imported beers and a brew-pub style menu and when it opened for business there was nothing remotely like it in Oshkosh. In fact, there wasn’t another spot in the city - be it a tavern or liquor store - that promoted their beer based on quality. It was all about quantity and price. The Old Town came in at a time when the Oshkosh beer scene was at one of its lowest points. Rahr Brewing had gone under and both Peoples and Oshkosh Brewing had been demoted to second tier status and selling their beer at prices well under those offered by the heavily promoted national brands such as Budweiser, Pabst and Schlitz. In addition, the aftershock of Prohibition was in full force. The drinkers who were coming of age in 1966 were the first generation whose parents had been born during the dry years. 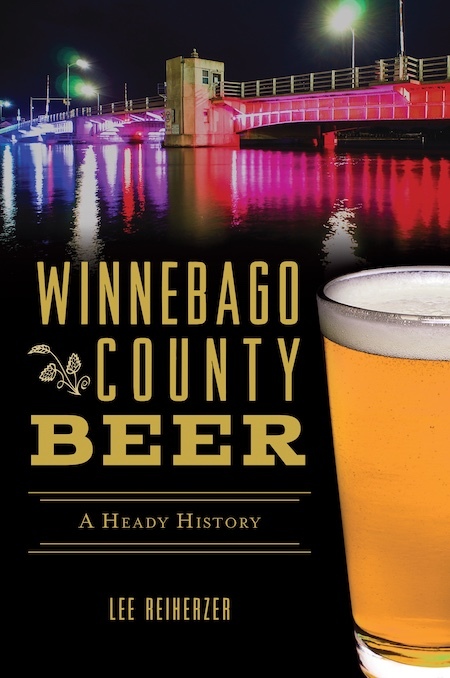 The beer culture that had been the birth-right of generations of Oshkosh residents had been effectively wiped away. Considering the atmosphere it was trying to do business in, it's not surprising that The Old Town lasted just six years. The pub closed in 1972 and the building that had been constructed for it was converted into a dentist's office. You can still see it today on the west side of North Main Street between Melvin and Prospect. 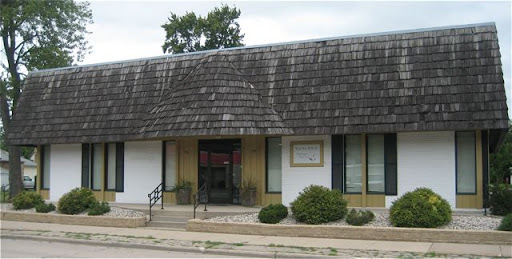 These days it's the dental office of Dr. Vin Vu and the facade offers not a clue that this was once the place to be if you were on the hunt for good beer in Oshkosh. Nobody deserves a vacation less than I, but that’s just how it works sometimes. I’m heading to Asheville, North Carolina to sample every beer I can get my hands on, so the blog will be on hold for the next week. Oshkosh Beer will resume September 14th. See you then! After all that squawking about hops yesterday, this was an easy choice for Beer of the Week. 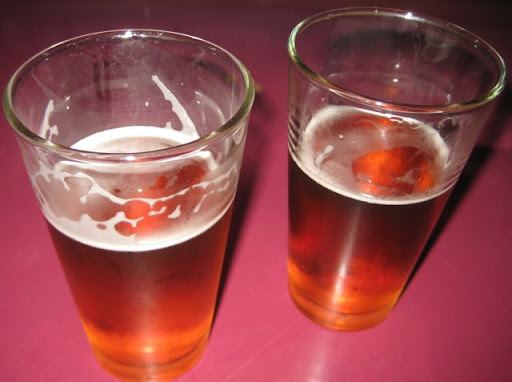 A Little Sumpin' Sumpin' Ale from Lagunitas has been flowing at Becket’s and catching the attention of Oshkosh beer freaks who crave a snootful of hops with their ale. This is an excellent end-of-summer brew that starts with a shout of American-hop aroma. Take a nice, long whiff off it. You’ll get grapefruit juice, pine, tropical fruit... all the usual suspects are there raising hell. But what differentiates this beer from your typical hop bomb is the smoothness of its flavor. The smell has you anticipating a punishing bitterness and though there’s all manner of “C” hop thunder in the offing, the beer finishes with a lightness that’s unexpected. The brewers at Lagunitas say they run a lot of wheat into this beer and perhaps that’s what accounts for the fluffy ending. For a high I.B.U. beer that clocks in at 7.3% this thing drinks ridiculously easy. Just one caveat: Becket’s has had this beer on for over a week now and the quick way they cycle through their taps probably means it won’t be around too much longer. If you want it, you’d better go get it. And if you miss it, don’t worry, you’ll be all right. A couple faucets over they’ve got Bitter Woman IPA from Tyranena pouring. There’s another beer that’ll fix your hop jones. Did you see the big, orange moon last week? It was a sure sign that another summer is coming to its end. 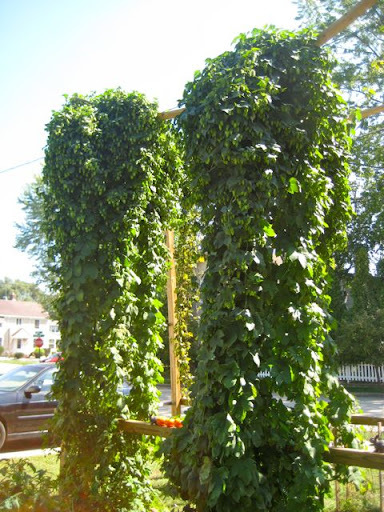 And with it goes the hop growing season in Oshkosh. So before those lush cones are pulled down, dried out and boiled into wort, let's see what the season has provided. 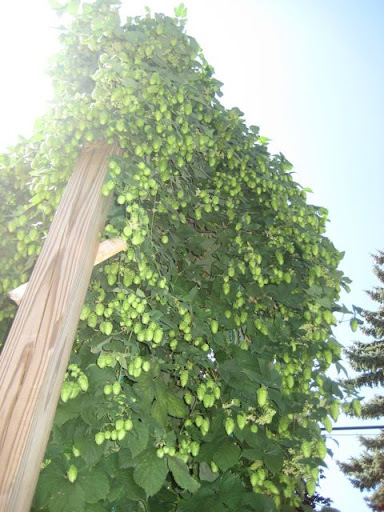 2010 was a good year for the hops. 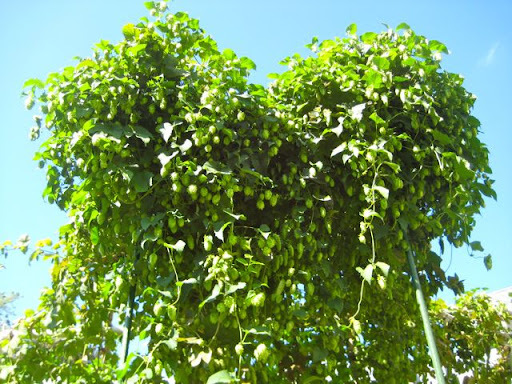 We'll start with the most fruitful hop farm within the city limits of Oshkosh. 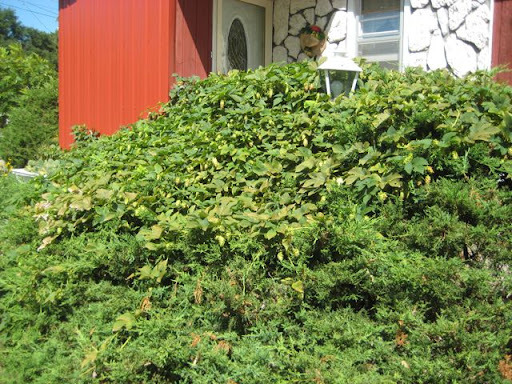 Not far from the corner of Jackson and Murdock, Nick’s Hop Operation is in its third year and in full bloom. He’s growing Zeus, Brewers Gold, Willamette, Cascade and Hallertau and most of his plants are loaded with fat, sticky cones that are bursting with aroma. When I walked up to take these pictures on Monday, I could smell hop resin from the sidewalk framing his yard. The growth of Nick’s set-up is amazing. To see how it’s progressed over the season go HERE & HERE. 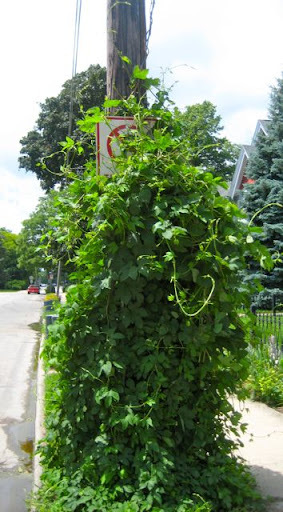 An utterly unique hop growing arrangement has developed on Adams Avenue. 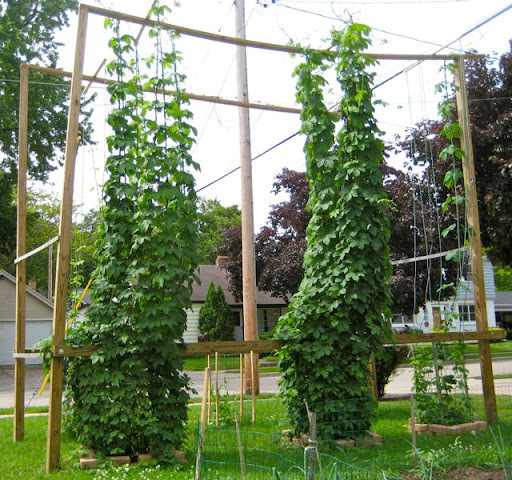 These are Scott’s hops and he's set them up in an unusual way. 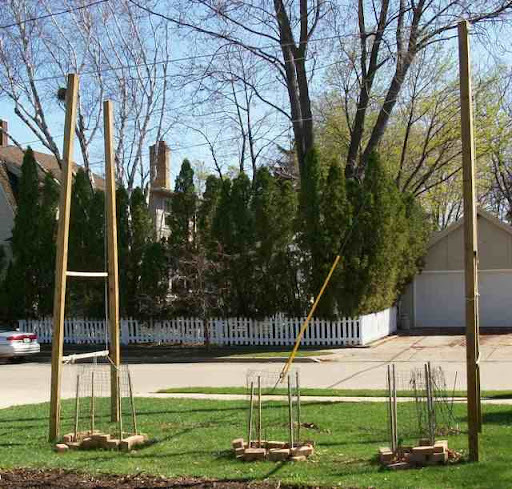 Instead of training his Cascades up a trellis or pole, he’s using an evergreen bush to support his plants. 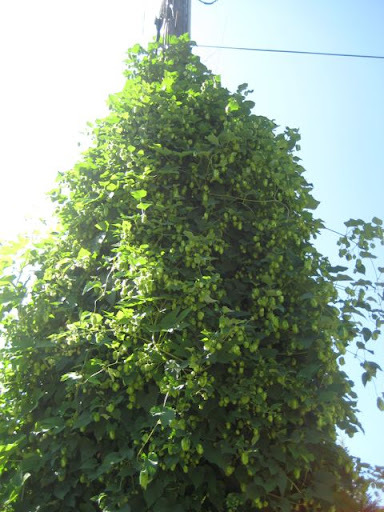 The hops and the evergreen have proven to be surprisingly compatible and at first glance the intertwined growth looks like a demented arborvitae sprouting hop cones. 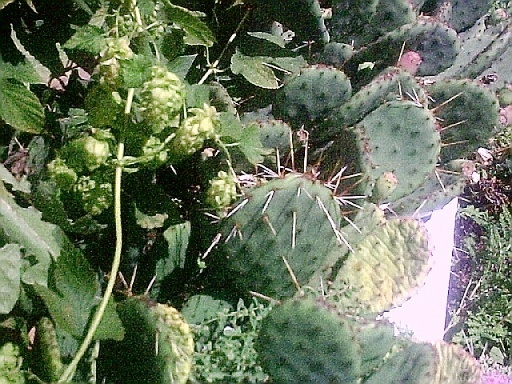 Stranger yet, Scott’s hops have meandered into a nearby prickly pear cactus and are putting out cones there, as well. 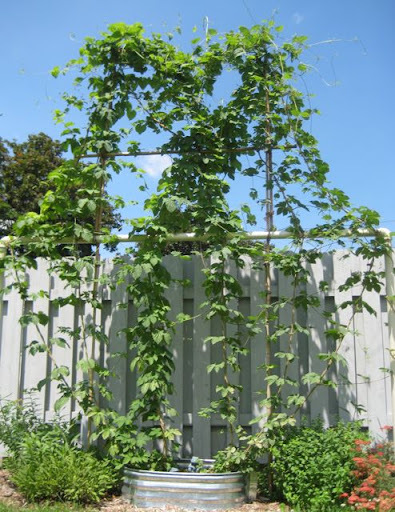 Maybe we’ve got a new strain of hop here. The Oshkosh Prickly Pear Hop is born! 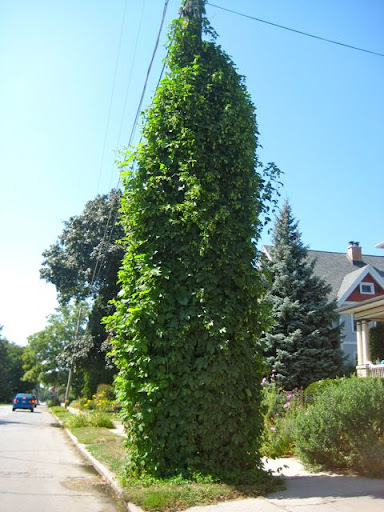 This must be the tallest hop plant in Oshkosh. It’s well over 25 feet tall and grows on a terrace near the western end of New York Ave. The plant’s incredible height is all the more baffling when you consider the small patch of dirt it occupies. This one is a late bloomer, but the cones have recently begun to develop and it should produce plenty of excellent fruit. If you haven’t seen this plant, take a drive down New York and check it out sometime. It’s a startling thing to encounter. THIS is what it looked like a couple months ago. 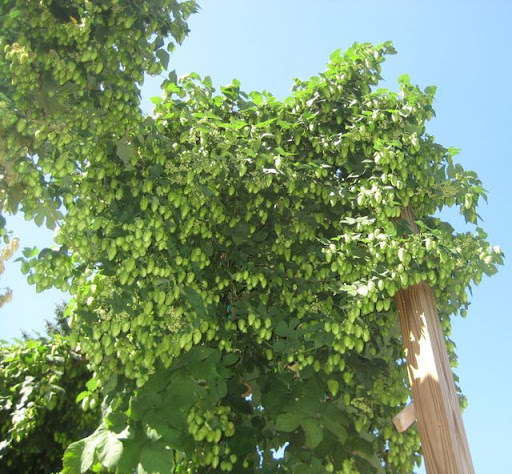 Finally, here are the hops I’m growing on Evans Street. They had a rough year. 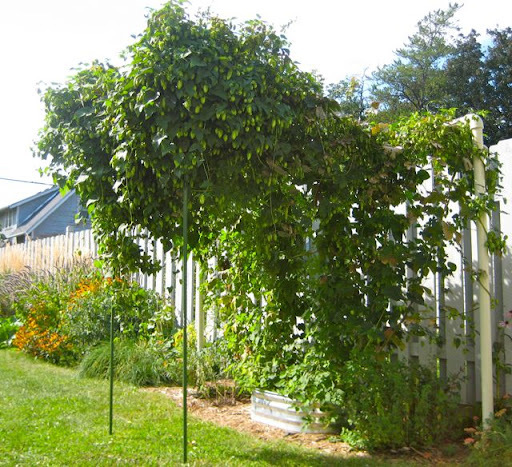 Twice they were flooded and the storm of July 14th ripped them down from their trellis. And though they had to learn to grow in a new direction (horizontally), they pulled through and are even thriving. These are a mix of Nugget and Cascade and I’m going to wait another week or so before I harvest them. I’m hoping to end up with about two pounds of hops after they’re dried, which ought to be enough to brew approximately 50 gallons of beer. THIS is what they looked like in mid-June. 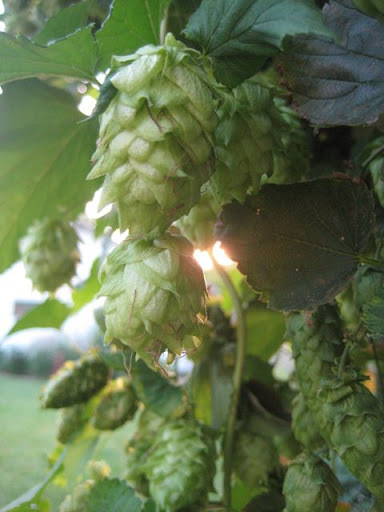 Thanks to the Oshkosh hop growers for their help over the course of the summer. May your beer be bitter!